Organist and improvisational artist Chaz Bowers has delighted audiences from his native Western Pennsylvania to the shores of Bermuda with masterful performances of pieces from the canon of great organ literature. Drawing on his own experience as church organist and the rich traditions of church music, Mr. Bowers presents programs that are designed to inspire. In addition to his many recitals, including St. Paul Cathedral in Pittsburgh and Wesley United Methodist Church in Hamilton, Bermuda, Mr. Bowers has dedicated numerous organs in the region, such as those at Elm Grove United Methodist Church in Elm Grove, WV and Christ United Methodist church in Scottdale, PA. He also frequently appears as guest organist with some of the area’s premier choral ensembles, most recently performing Rejoice in the Lamb (Benjamin Britten) with Voces Solis, an all-professional choir, Messe Solennelle, Opus 16 (Louis Vierne) with the St. Vincent Camerata, and Requiem, Opus 9 (Maurice Duruflé) with the St. Vincent Camerata and Academy Chamber Orchestra. Mr. Bowers is also a respected composer of sacred music: his setting of “O Breathe on Me, O Breath of God” was released by GIA Publications in early 2017. For the 150th Anniversary of the Church of the Immaculate Conception in Irwin, PA, he composed “Piece du Festival” for Brass, Timpani, and Organ, as well as the Mass of the Immaculate Conception. Since 2014, Mr. Bowers has served as Director of Music and Principal Organist at St. Bernard Parish in Mt. Lebanon, PA. He is also Coordinator of Sacred Music and University Organist at Seton Hill University in Greensburg, PA. Prior to his appointment to St. Bernard’s, he served for five years as Director of Music at the Church of the Immaculate Conception in Irwin and Assistant Organist at Greensburg’s Blessed Sacrament Cathedral. Mr. Bowers holds his Master’s Degree from Duquesne University, studying organ and improvisation with Dr. Ann Labounsky. His undergraduate studies were completed at Seton Hill University, where he studied organ and service playing with Edgar Highberger and organ improvisation with J. Christopher Pardini. 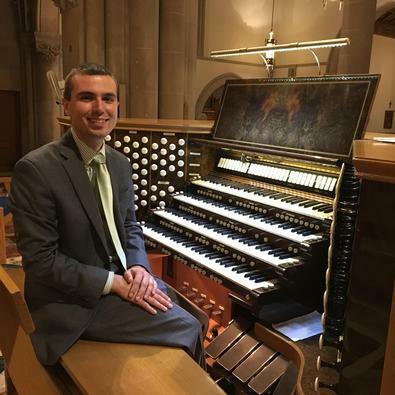 As part of a 2013 mini study-abroad tip with the organ studio at Duquesne University, he had the opportunity to perform on many of the great organs of Paris, at Notre Dame Cathedral, Basilica of Saint Clotilde, the Church of Saint Sulpice, the Madeleine Church and others.